We wanted to implement this feature when we upgraded to the new responsive UI in Sep 2016, but couldn’t do so at the time because the underlying framework didn’t support multi-select on drop-down lists. 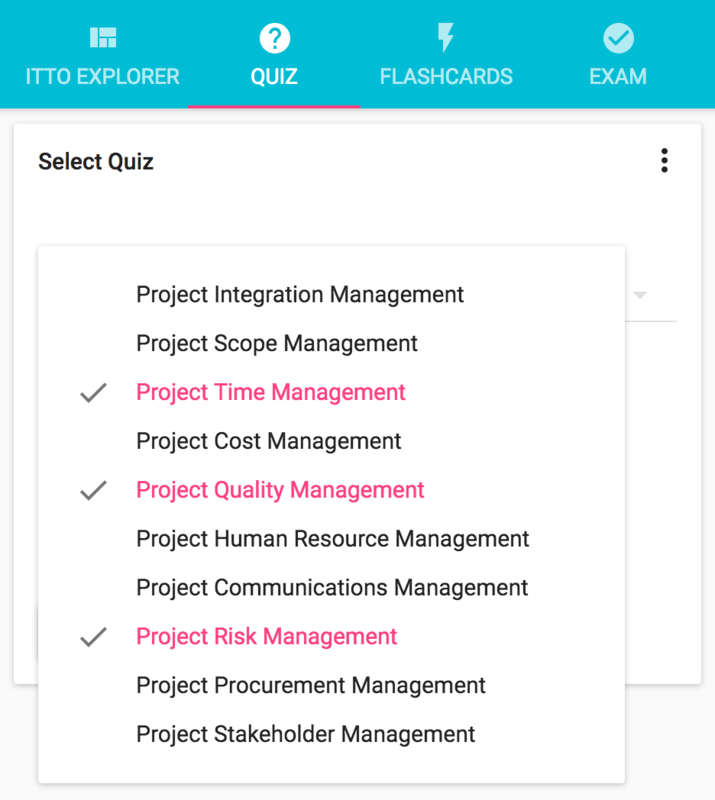 A new version of the framework added multi-select feature to drop-down lists, and so did we on the Quiz. There’s a big caveat when taking quiz by a specific knowledge area. The number of unique questions that our quiz engine can generate is extremely limited when you select a particular knowledge area. Due to this, you’ll start to see the questions repeat very soon. 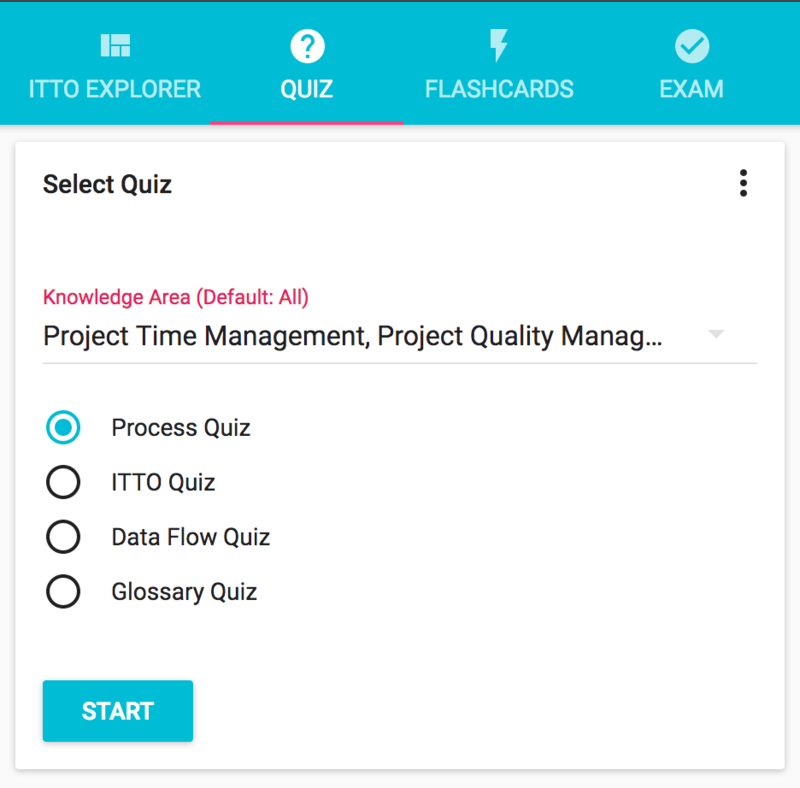 But if you take the quiz by “All Knowledge Areas”, the quiz engine has 49 processes and 1452 ITTOs to work with and the number of unique questions that it can generate is practically unlimited. We recommend that when you begin your preparation and study each knowledge area from the PMBOK Guide, take a quiz for the corresponding knowledge area in order to test your knowledge. As you progress to the next chapter / knowledge area, select all the knowledge areas that you previously covered. Repeat this process as you progress from chapter to chapter until you’ve covered all the chapters (chapters 4 to 13). Ultimately, you should take the quiz for All Knowledge Areas to utilize the full potential of the quiz engine and challenge yourself to the limit. We encourage you to try the new feature and tell us know what you think of it using the comments box below. We also welcome your ideas to further improve our product.